Up Close! : Pen and Bobz...on the run! Pen and Bobz...on the run! Last September 17, 2008 another team member arrived from Skatchewan, Canada. She’s eighteen years old. She just graduated from high school. 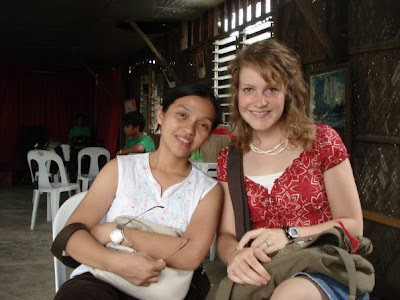 And for me she’s very young to go out of her comfort zone and be a part of a missions team here in the Philippines. She loves to draw, paint, play piano and a lot more…and by the way…in all of these… she’s really good. Her name is Robynn Connie Irene Carter, the eldest among three siblings. Her parents are very supporting in her choice of life as long as it will do good to her and will bring glory to God. Her dad is a pastor and her mom is a teacher. She’d been here for a month and she helps with Pen in the “Partnership Department”. What they do is… they go from one church to another and from one place to another to offer the YM partnership. They travel a lot specially when they do training and seminars. Robynn and Pen just enjoyed traveling together. So now that there’s the two of them…we just know that there would be more churches to visit for teams. Thanks guys for all your effort and perseverance. May God bless you…more than you ask or imagine. Well done. Very well done. You should look into journalling...God has gifted you with these skills..
how I love you too! I enjoy reading your blog...quite refreshing.